Mark Moseley and Robert Clephane had a brief fishing session in the afternoon near the local Werribee River mouth entrance. Immediately the guys started catching small Bream on frozen chicken and lightly weighter maggots. 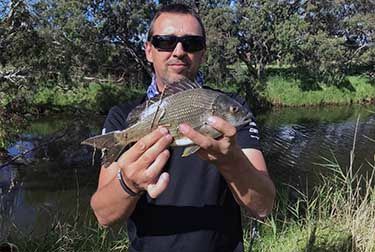 Mark almost lost his rod to a large sized Bream that took his rod of the holder and into the shallows but was unable to land it but did managed to redeem himself with a very healthy Bream as shown in the picture to the left.